First, Carson Wentz got his BFF (best friend forever) Jordan Matthews, back on the team. Next, he got his BCR (best current receiver) Alshon Jeffery, back from injury. That combination was a lethal one last Sunday afternoon, as Jeffery returned to catch eight passes for 105 yards. And while Matthews only had one catch for 56 yards, it was for the game’s first touchdown that put the Eagles up 7-3 late in the 2nd quarter. Add to that Zach Ertz’s ten catches for 112 yards, and the Eagles passing game had them up 17-3 halfway through the third quarter on a gorgeous sunny day in Nashville looking full of roses and rainbows. Unfortunately, by the time the game ended, the city that is the home of the Country Music Hall of Fame had the Eagles singing only the blues, as Tennessee rallied for a 26-23 victory in overtime. What was a comfortable 17-3 lead turned into a Titans 20-17 lead before the Birds woke up to tie the game with 16 seconds left. But on the play before, the Eagles, facing 3rd & 3 from the Titans 12, somehow chose to throw a fade pattern into the end zone that had no chance of being caught, which had me scratching my head. A better play call there might have given the team a chance to win with a touchdown in regulation. But all that didn’t seem to matter when the Eagles got the ball first in overtime at their own 25 and, within five plays, already had a 1st down at the Titans 17-yard line. Surely, the defending Super Bowl champions would continue this drive with ease and take it in for a touchdown, ending this game once and for all? But the Eagles lost two yards from that point forward, which meant that even though Jake Elliott’s 37-yard field goal sailed through the uprights with ease, the Titans still had a chance to tie or win the game. What followed was disconcerting to say the least, as the Birds defense allowed Tennessee to convert not one, not two, but THREE 4th downs to keep their hopes alive and eventually seal the victory with a touchdown. The worst one was the first, as on 4th & 15 from their own 31, Titans quarterback Marcus Mariota dropped back to pass and found a wide open Taywan Taylor out for a leisurely stroll 19 yards down the sideline. Mariota threw the ball his way and Taylor turned to his left to catch it without so much as an Eagle in the vicinity to disrupt him. Last season, the Eagles would have stopped the Titans right there. Last season, even after Tennessee had cut the Eagles lead to 17-10, this team would have found a way to counter with a score of their own, dashing any hopes the Titans would have had of making a game of it. But last season, the Eagles were an unknown who had never won a Super Bowl in their history. A byproduct of being defending Super Bowl champs is that no one will take this team lightly on any given Sunday. Even the teams that range from downright putrid to slightly above mediocre (like the Titans) will play the Eagles as if it’s their Super Bowl, as witnessed by the fact that Titans fans (which only made up half of the stadium due to the large influx of Birds fans that made the trip to the Music City) celebrated as if they had actually won something after the game was over. A 3-1 start would have put this team in a good position. A 2-2 start is somewhat precarious, as the schedule is brutal, with trips to New Orleans and Los Angeles still on tap for the 2nd half of the season. The Eagles got to the Super Bowl last year because of a nine game winning streak in which they did not lose a game for over two and a half months, which set them up with the #1 seed & homefield advantage in the playoffs. Travel on the road in the postseason to Minnesota, Atlanta, or L.A with your backup quarterback last season, and I don’t think the Birds are Super Bowl champions. While it’s still early, the Rams are already 4-0 and hold a two game lead over Philadelphia for the top seed in the NFC. And while injuries can quickly change any team’s fortunes, the Eagles can’t afford any more bad losses. This week’s opponent, the Minnesota Vikings, also had high hopes for 2018, especially after acquiring Kirk Cousins from the Redskins to be their starting quarterback. But they’ve also gotten off to a slow start with a 1-2-1 record, and cannot afford to fall back any further in the NFC “Frozen” division (that’s NFC North for those of you keeping tabs). This Sunday would be a good time for the Eagles to start to right the ship. Problem is, Kirk Cousins knows the Eagles too well, having faced them twice a year over the last six years. However, playing at home before their home crowd, the Birds seem to do quite well under Doug Pederson, and should continue that trend this week. Birds win 27-23, and hope prevails for a Super Bowl repeat…for at least one more week. This team seems to be making a habit of this. Three times in their last four home games dating back to last season, their opponent has gotten within ten yards of the end zone in the closing minutes of the game with a chance to win. And all three times, the Eagles have come up victorious. The first game of the three was the reason their playoff run continued last season, and one of the main reasons we can emphatically declare them Super Bowl champions for the first time. But with the exception being the NFC Championship against the Vikings, the Eagles sit at 2-1 on this young season because their defense stiffened when it needed to, and stopped the Falcons and Colts when they were in danger of stealing the game. The Birds could have easily been 0-3 right now, and contemplating what might have been. But good teams find a way to win these games, which is what the Eagles are. But how long can this go on? How many weeks can this team expect their defense to pull a rabbit out of their hat? To be fair, they were playing with their backup quarterback (Nick Foles) the first two weeks, though the “devil’s advocate” in me will say that this is the same backup quarterback who won them the Super Bowl last season. In addition, the “chosen one” (Carson Wentz) was understandably a little rusty his first week back, as witnessed by his best Johnny Manziel impression, when he stared down Zach Ertz on a poorly thrown pass that was intercepted by the Colts Anthony Walker. Luckily, Indianapolis could only muster a 31-yard field goal, which helped to mitigate the damage. It also didn’t help that the Eagles were still playing like a “MASH” unit, with many of their starters, including wide receiver Alshon Jeffery and running backs Darron Sproles and Jay Ajayi, still out last week. Luckily, Wendell Smallwood came up big in their place, and Bucks County rookie Josh Adams and 2nd year back Corey Clement played admirably as well. This week, the Birds travel to Nashville to face the Titans and maybe catch a country music concert while they are there. Not sure if Elvis will be making the trip from Graceland for the game, but it does look like many Eagles fans are hoping to make it a grand old party at the Grand Ole Opre, as many are expected to travel out to the “music city” to cheer on their Birds. As of now, it looks like Alshon Jeffrey should be back in the lineup, which will help the Eagles and Carson Wentz get their groove back in the passing game. It has been a long time since the days of the “Music City Miracle” for the Titans, but they currently stand at 2-1 as well and are hoping that Tennessee quarterback Marcus Mariota can be their future savior…if he can actually stay healthy. This will not be an easy game for the Birds on the road, but Wentz and the crew will prevail 24-16, before partaking in any country line dancing. 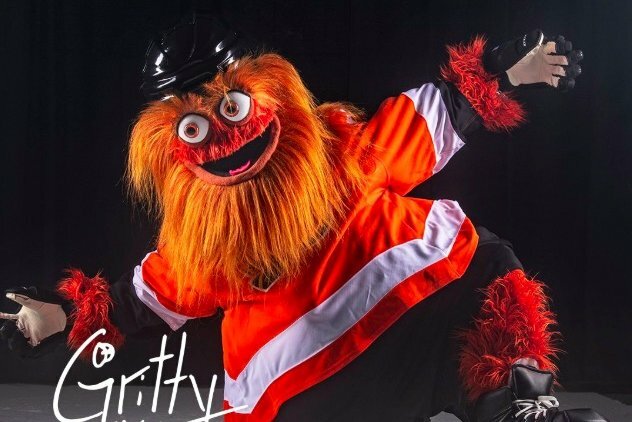 Ladies & gentlemen, meet “Gritty”, the brand new mascot that the Flyers unveiled this week. At first glance, this looks like a character from “Fraggle Rock” gone awry. Plus, as opposed to endearing (e.g the Philly Phanatic), this creature looks like something that my six year old niece and two year old nephew would be terrified of. If this is a harbinger of things to come, the Flyers may be in for a very long season…. NFL prognosticators are very much like meteorologists – they can be wrong just as often as they are right. Most pundits had looked at the Tampa game in week #2 and figured that a trip to Florida would be, no pun intended, a “day at the beach”. Many figured that by the time the 4th quarter rolled around, the backups would be filling in to handle mop-up duties while the starters were drinking Mai-Tai’s on Clearwater Beach and searching for retirement homes for when their playing days are over. Yours truly, who had spent the weekend in Sarasota celebrating the union of “S & S” into marital bliss, was also guilty of thinking the same. So when all of us headed into the security line at Tampa’s Raymond James Stadium and heard the sound of the cannons being fired from the pirate ship in the north end of the stadium, we assumed it must be due to the opening kickoff. But no, before the sweat had even begun to drip off the brow on what was a very sweltering (and typical) September day, the Buccaneers had already scored, thanks to former Eagle DeSean Jackson, who was cut by ex-Eagles coach Chip Kelly four years ago. The player whom the Eagles got absolutely NOTHING for in return torched his former team on the first play from scrimmage for a 75-yard touchdown catch, and ended the day with four receptions for 129 yards. Meanwhile, the Eagles offense decided to shoot itself in the foot with bad plays and penalties, and what was a 7-0 deficit eventually turned into the Birds being behind 27-7 before finally waking up and coming back to make it a one-score game at 27-21. But it was too little, too late, and the defending champions will come home with a record of 1-1 on this young season. This loss is not the end of the world. This team was 1-1 last season after a road loss to the Kansas City Chiefs before rolling off nine straight wins and winning their division on the way to the Super Bowl. And there is no reason to think they cannot have another successful season. The key for this week is that Carson Wentz will be back under center for the first time since December 10, 2017, when he was injured for the remainder of the season. Carson Wentz makes the team around him better. Nick Foles looks better because of the team around him. Foles had a great supporting cast last year, which helped to propel the Eagles to their first Super Bowl victory. But Wentz will be the difference maker for this team. When healthy, he has the ability to be a game changer, and should be the Eagles starting quarterback for at least the next ten years (keeping my fingers crossed when I say this). The Eagles face the Indianapolis Colts at home this week, a team which has had its own share of health concerns concerning their quarterback. The condition of Andrew Luck’s shoulder over the last two years has been a bigger mystery than what happened to Tony Soprano in that diner when the screen went blank with Journey’s “Don’t Stop Believin” playing in the background. But while we’ll probably never know what the producers of the Sopranos were thinking, we do know that Luck is finally back healthy for the Colts after a 19 month hiatus, which makes them a team to not be taken lightly. The good news is that the Birds, and their fans, will be ready to hop on the newly refurbished “Wentz Wagon” as it exits the tunnel to a chorus of cheers, and should give this team a boost on the field, even though he will be somewhat rusty in my opinion. So what about the score? 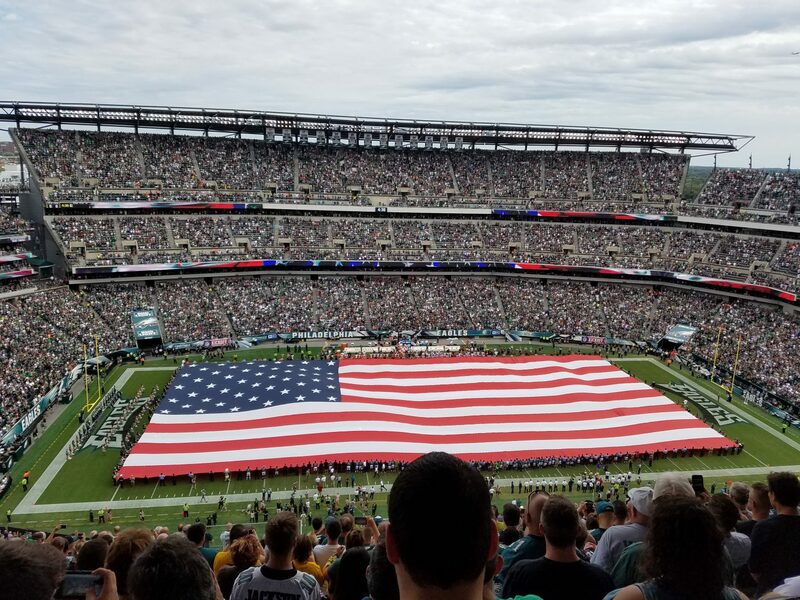 Reader Arun H. had predicted a 20-13 Eagles win in the opener and was almost spot on (final score was 18-12 Eagles) so I’m piggybacking on his prediction for this week, which is an Eagles victory, 27-16. If he’s right again, I know who I’ll be calling for my future Powerball lottery numbers. While the threat of lightening before last week’s much anticipated season opening “raise the championship banner” game never came to fruition, lightening did strike once again in the closing seconds of an Eagles – Falcons game at home. Much like the divisional playoff game last January, Atlanta managed to drive the ball all the way down inside the Eagles 10-yard line with time winding down, causing a lot of nail biting with the faithful who had come out on a surprisingly humid early Sept. night. But once again, it was the Eagles defense that came up big when a pass that was intended for Julio Jones was ruled incomplete due to being caught out of bounds, and the local Birds escaped with a win in the opener that kept the “feel good” positive atmosphere that has surrounded this team since last February alive for at least one more week. That’s not to say that there isn’t work to be done. The offense struggled, just as they did in last year’s playoff game, but managed to keep it close and score when needed. But games like this on a consistent basis will not a Super Bowl repeat champion make. On the positive side, the Eagles defense looks to be its strength, at least for now. And there is no reason why Nick Foles cannot improve his play, just as he did in the NFC Championship and the Super Bowl. The Birds really have no choice until Carson Wentz is cleared to play, which could be as early as next week at home against the Colts. But first, the team must travel to Tampa for a contest that initially looked like a day at the beach (Clearwater beach to be exact). But that was before the Buccaneers went down to the Big Easy and gave a spanking to the New Orleans Saints, who many had picked as their Super Bowl favorite. Tampa quarterback Ryan Fitzpatrick, who has journeyed around the NFL more than Anthony Bourdain has journeyed around the world, ran roughshod over the Saints defense last week in a 48-40 Tampa win. But while the “Fitz” hasn’t met a barber he actually likes, it seems that he does have a duo of quality receivers that get his beard all tingly, most notably Mike Evans and former Eagle DeSean Jackson. The Eagles defense will have to come to play, and cannot afford to take Tampa lightly. On the plus side, even though this is technically a road game, count on a “Tampa Takeover” as Eagles fans will be coming in from both near and far to soak in the sun and suds, and support their team like very few fans can. Much like the Chargers game last year, there could very well be more Eagles fans than Bucs fan at this game, which would make it a surreal situation when a chorus of boos roll out when the home team is introduced. But along with the Eagles strong travel contingent (including yours truly who will be attending a wedding in Sarasota the night before), there is already a legion of Eagles fans who are transplants from the Delaware Valley who get together every Sunday to watch their beloved Birds at the Crowne Plaza Tampa Westshore (near the airport). The group is appropriately known as “Tampadelphia”, and when I was visiting Tampa last December and looking for a place to watch the Eagles – Giants game with fellow Birds fans, I happened to find this group with the help of a local Eagles fan. While I think that the Eagles will face a tougher test this week than originally thought, they are still the better team, and should come out ahead, 31-17. After 58 years of frustration, mediocrity, some close calls, and a lot of heartbreak, the team from the city of brotherly love finally broke through the steel gates in grand fashion and brought their city what they have richly deserved for so long…the team’s first NFL championship of the Super Bowl era. What made it even more special was that it was totally unexpected. This was not one of those teams from the Andy Reid/Donovan McNabb era of the early 2000’s when everyone figured that the Eagles would easily win the division and go to the NFC Championship game with a reasonable shot to make it to the Super Bowl. If one were to go back to Labor Day 2017 and find anyone that predicted that this team would win it all, they would probably be labeled a dope or moron (and not just by Howard Eskin). No, 2018 was a season in which a 9-7 record would have signaled a step toward respectability and a sign that the team’s 2nd year quarterback was progressing in the right direction. But somewhere along the way, someone forget to tell this team that merely earning a winning record was good enough. A 61-yard field goal by kicker Jake Elliott as time expired gave the Eagles and their fans an exhilarating last second win in their home opener and kick started a nine game winning streak, which put the Eagles at 10-1 and gave the league notice that they were serious contenders to become the NFC representative for the Super Bowl. But a week 14 road win against a tough Rams team, which clinched the NFC East, was tempered by the fact that their star quarterback, Carson Wentz, would be out for the remainder of the season. And when his backup, Nick Foles, looked downright awful in his last two regular season games, many felt that the the Birds would be “one-and-done” in the playoffs, and that Carson Wentz’s injury was just another sign that this team was eternally cursed. Most national prognosticators seemed to agree with that sentiment as well, as the Eagles entered the playoffs as the first #1 seed since the 1970 Colts to be underdogs in the divisional round of the playoffs. But with coach Doug Pederson tailoring the offense to his quarterback’s strengths, and Nick Foles’s improved play, the Birds squeaked past the Falcons on a defensive stand, and then blew out the Vikings to earn the right to play in a Super Bowl that no one expected them to be in during the dog days of summer. And who could have asked for a better opponent than the New England Patriots? The same team, quarterback, and coach who had defeated the Birds in their last Super Bowl appearance 13 years earlier would be the foe they would have to exercise their past demons against. And in a game that was one for the ages, the Birds played with an aggressive style that their former coach, Andy Reid, would never have done. If Reid had still been the Eagles coach, the “Philly Special” would have been replaced with a field goal, and the gutsy 4th & 1 when Doug Pederson gambled and went for the first down and succeeded with 5 minutes left in the game (which eventually resulted in the winning touchdown) would have been replaced by a punt and a 33-30 Eagles loss. Pederson deserves all of the accolades for his play calling in the Super Bowl, and this team deserves all of the credit for rallying together as “underdogs” and jelling at the right time. Abhi K., a longtime Philadelphia sports fan and his prized “We are #1” pose in many of our childhood photos. My father, who had me change the channel to the Eagles game at 1 PM one Sunday afternoon when I was 7 years old. The television has been replaced multiple times since but what is being watched has remained the same. Longtime Eagles season ticket holder Steve M., who ironically happens to be married to a lifelong Giants fan. I guess opposites actually do attract. Janaki Maushi, who still follows all the Philadelphia sports teams even while living 8,000 miles away from Broad & Pattison. My mom and her “halftime hoagies” all throughout my childhood. They were always served with a smile, even on days when the Eagles had given you nothing to smile about. Joe L., my season ticket comrade for 18 years. Arun Kaka, who is always optimistic that the Eagles can go 16-0, even in years when it looked like they may go 0-16. My sister, “The Neelj”, who’s knowledge of Eagles football is second to none. Shashi Maushi, who’s smile is always missed when the Eagles win a big game. Pathak Kaka, to whom I lost every Eagles bet I ever made. Luckily, he never made me pay up and actually wash his car. Merrill Reese & Mike Quick, who make it worthwhile to turn down the sound on your TV and turn up the radio. Much like Harry Kalas before them for the Phillies, the game would not be as enjoyable to watch without them. Anthony Gargano (the cuz) – a “4 for 4” Phila. sports fan & radio personality on 97.5. Ray Didinger – the reason to DVR “Eagles Postgame Live” on my way home from the Linc. Last but definitely not least, my uncle Kishor. While he has not been with us since 2010, he was a huge Eagles fan who I had the pleasure of watching many Eagles games with in person. While sitting at my seat at U.S Bank Stadium following the Eagles Super Bowl win, I couldn’t help but think that he was there in spirit, commenting about how awesome that “Philly Special” call was. So what can we expect from the 2018 season? Repeating as champions is never easy, as it has only been accomplished eight times previously, but this team has the talent to do it. But so often, the fire to repeat is not the same as winning it the first time, and complacency can often get in the way. The one difference with this team is that their star quarterback wasn’t able to be there during last year’s stretch run due to injury, and whether he says so publicly or not, he wants to win it with the team on HIS shoulders…not as a spectator on the sidelines. Carson Wentz could be the reason this team repeats, but there will be a bullseye aimed at the Eagles by every team they face. Week #1 will be a tough test, as the Atlanta Falcons are out for revenge, especially after falling two yards short of advancing in last year’s divisional playoff game. Birds fans will be psyched to see the team’s first ever Super Bowl banner being hoisted at Lincoln Financial Field during the pregame ceremonies, but once kickoff takes place, that banner will become yesterday’s news as far as the game is concerned. Luckily, the return of starters such as Darren Sproles, Jason Peters & Nelson Agholor will help to clear out the preseason cobwebs, and the Birds win their opener, 31-21, to get their season off on the right foot. As for Broad & Pattison, it will continue to turn…but this time with it’s inhabitants as defending champions. Has a nice ring to it don’t you think?